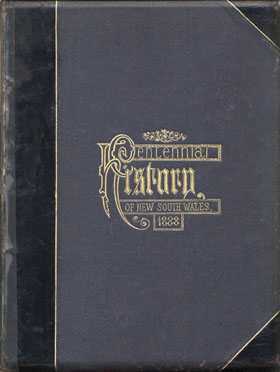 Aldine Centennial History of New South Wales' in a two volume set as a comprehensive and beautifully illustrated record of the history of New South Wales and its prominent inhabitants. The first volume is divided into thirty-three chapters and covers topics including the early explorers, geography, aborigines, flora and fauna, governors of New South Wales as well as the Constitution. Volume two has another four chapters which complete the history section. The fascinating part of this dataset (apart from the hundreds of superb illustrations throughout), is the large biographical section which consists of nearly half of the whole set. The biographies of noted identities cover not only those from Sydney city, but also from the suburbs and regional areas. Each are grouped by town and have at least a paragraph on each person, though some are quite extensive. Details can include parents' names, emigration details, birth place, education, and employment history. Usually there are additional anecdotal details such as C.T. Abbott, a hospital superintendent, whose hospital at Wagga Wagga "possesses excellent accommodation for all purposes ... and both the exterior and interior of the hospital reflect credit on the management of Mr Abbott".